Plant Talk 4: Botany in a Day Pages 14-24 5th ed, 15–22 6th ed. Wow is spring ever springing in southern Appalachia…i have been busy as a bee teaching classes, doing botanical surveying of various properties, and working for Plants and Healers International. Still on the search for Morel Mushrooms (Morchella spp.) the most choice fungi of Spring. Dryad’s Saddle (Polyporus squamosus) is another second prize fungus people are also finding out in the woods. Have you noticed any interesting fungi out and about? Since last class i have noticed Iris (Iris cristata and Iris spp. ), Azaleas (Rhododendron spp. ), Bachelor’s Buttons (Centaurea cyanus), Black Locust (Robinia pseudoacacia), Blue Cohosh (Caulophyllum thalictroides), Buckeye/Horsechestnut (Aesculus spp. ), Clematis spp., Columbine (Aquilegia sp. ), Comfrey (Symphytum officinale), Dwarf Larkspur (Delphinium tricorne), Fern Leaf Phacelia (Phacelia bipinnatifida), Fire Pink (Silene virginica), Fringe Tree (Chionanthus sp. ), Goldenseal (Hydrastis canadensis), Japanese Honeysuckle (Lonicera japonica), Firethorn (Pyracantha sp.) Fleabane (Erigeron spp. ), Phlox spp., Princess Tree (Paulownia tomenetosa), Red Hot Poker (Kniphofia uvaria), Red Tip Photinia (Photinia sp. ), Rugosa Rose (Rosa rugosa), Skip Laurel (Prunus laurocerasus), Silverbell (Halesia sp. ), Solomon’s Plume (Maianthemum racemosum), Spotted Geranium (Geranium maculatum), Stone Crop (Sedum ternatum) Sweet Cicely (Osmorhiza claytonii), Trilliums (Trillium spp. ), various Violets (Viola spp. ), Valerian (Valeriana officinalis), Weigelia sp. and Wild Black Cherry (Prunus serotina), Wild Comfrey (Cynoglossum virginianum) all blooming. For those in the Asheville, NC area the NC Arboretum has a national collection of all the Azaleas that grow in the southeast. How many plants mentioned above do you have in your area or how many do you recognize by name? What’s blooming around you? Do you have something to contribute to the list that is blooming now in your area? The exception rather than the rule is for monocots to be edible. One exception is the Grass family (Poaceae) where most of our grains come from. Which members of the Grass family do you regularly consume? Another major monocot food family is the Palm (Arecaceae) from which we get Dates, Coconuts and the product of sometimes incredibly environmentally destructive practices known as Palm oil and Hearts of Palm as well as some other more minor crops (Balick & Beck, 1990; Bernal, Galeano, García, Olivares, & Cocomá, 2010; Craft, Riffle, & Zona, 2012; Ellison & Ellison, 2001; Haynes & McLaughlin, 2000; Mayfield, 2005; Pye & Bhattacharya, 2012; Sylvester & Avalos, 2009; Sylvester, Avalos, & Fernández, 2012; Van Wyk, 2005). Members of the Onion genus Allium were formerly put in their own family the Alliaceae but now are in the Amaryllidaceae. The Day Lily (Hemerocallis fulva) from the Hemerocallidaceae is another edible monocot. However, many taxa from the monocots are deadly poisonous. Even the Day lily mentioned above that has been consumed for thousands of years in Asia can cause intestinal upset in a small percentage of people. The devil is in the details! Ramps (Allium tricoccum) which are popular in Appalachia this time of year look very similar to the deadly Lily of the Valley (Convallaria spp.). They are also in threat of overharvest and probably need to be more intentionally cultivated and wildcrafted as well (Bentrup, Chamberlain, & Kellerman, 2011; Chamberlain, Bush, Hammett, & Araman, 2002; L & Chamberlain, 2009; Rock, Beckage, & Gross, 2004). Concerns have been expressed in various mainstream outlets from the Huffington Post to the Chicago Tribune and New York Times. NC State University and Purdue University have some good information on cultivation. On page 16 in the 5th ed. and 19 in the 6th ed. Thomas gives an overview of the plant family concept. i would only qualify page 16 in the 5th ed. by saying that we have more like 150-200 flowering plant families in the temperate world rather than the 100 that Elpel refers to. On pg 16 in the 6th ed. 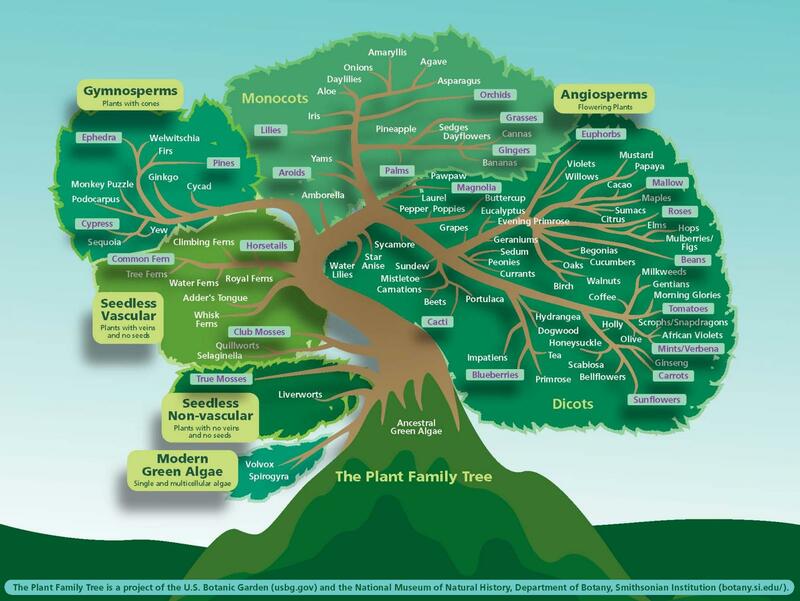 Thomas has added a beautiful family tree that is very helpful in visualizing the evolutionary history of the flowering plants. You can see some thing similar courtesy of the US Botanic Garden linked here. You will surely recognize many orders shown here by their common names already. Page 18 in the 6th edition looks more in depth into the fusion of carpels described in brief on the inside front cover of all versions. Understanding the differences here can take a bit of time but is very helpful in distinguishing between different closely related or similar looking families especially ones with five petaled flowers. This skill may be especially important for any aspiring field botanist or wildcrafter. The Brassicas (Brassicaceae/Cruciferae) are very prolific and represent one of the most choice and nutritious families for greens in the temperate world. They are relatively easy to know due to distinctive four petaled flowers, different sized stamens distinctive tastes and smells. They also are known to potentially take up heavy metal pollution when present and some members are used intentionally in the process of phytoremediation due to this propensity (Anjum et al., 2012). The Celery family (Apiaceae/Umbelliferae) is very distinctive for their compound umbels. This family is also famous for being the home of many edible and medicinal plants. However, it also contains some of the most poisonous plants in the world including Poison Hemlock (Conium maculatum) and Water Hemlocks (Cicuta/Oenanthe spp.) (Schep, Slaughter, Becket, & Beasley, 2009; Vetter, 2004). Whenever working with this family one must be doubly sure of positive identification! Sweet Cicelys (Osmorhiza spp.) are a favorite wild edible that can look like poison hemlock at times. i have turned up a little literature about this genus specifically (Lowry & Jones, 1984; Wen, Walck, & Yoo, 2002). The Mallow family (Malvaceae) has some of the most distinct flowers in the world. Therefore, this is a very easy family to ID when blooming. It is also a rather gentle family in relation to toxicity. i take some exception that of over 1,500 species that Cotton is the only one with toxic properties, but i also have not seen any information on other toxic ones yet. Okra (Abelmoschus esculentus) is not a type of Hibiscus as Elpel states in the 5th ed. Here's a link to the Malvaceae monograph under the plant families tab here at the website. The Rosaceae is the number one family for temperate fruit and rather easy to identify in tree and shrubby forms. Smaller plants in the family can sometimes be confused with members of the typically poisonous Ranunculaceae family. This is a good family to learn about the phenomenon of stipules (leaf like appendages occurring where the leaf petiole meets the main stem). It is also a family with quite a bit of taxonomic debate over the years which is possibly still a work in progress regarding the sub-family/tribe level of distinction (Potter et al., 2007). Here is a link to a Rosaceae monograph. What would you like to add about this fascinating family? The Poaceae as stated above is a major food family. It is one of the largest families in the world and has a rather complicated taxonomy (Barker et al., 2001). Probably almost all the members could be used for their grain in a pinch. Gluten is a protein fraction contained only within some members native to Africa, the Middle East and Mediterranean as far as i know. The next class will be posted around May 22nd and will cover the pages 25-36 5th ed and 23-35 6th ed. These are the keys that Elpel uses to put plants into their respective families. It might be easy to be overwhelmed by the density of information on these pages. Slowly slowly…. Just glance over it periodically over the next couple of weeks rather than try to absorb it all right away. See if you can get some major patterns to stick. Please let me know your thoughts in general and any way i can help this class serve you best. Mayfield, M. M. (2005). The Importance of Nearby Forest to Known and Potential Pollinators of Oil Palm ( Elaeis guineënsis Jacq. ; Arecaceae) in Southern Costa Rica. Economic Botany, 59(2), 190–196. Wen, J., Walck, J. L., & Yoo, K. O. (2002). Phylogenetic and Biogeographic Diversification in Osmorhiza (Apiaceae). Annals of the Missouri Botanical Garden, 89(3), 414–428.